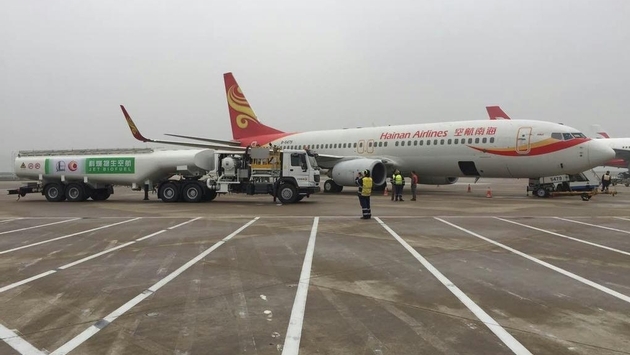 Everything about a recent, regularly scheduled Hainan Airlines flight was routine, 100 passengers flew from Shanghai to Beijing in a Next-Generation 737-800, but it was the fuel powering the engines that made the journey a milestone for China's aviation industry, eturbonews.com reported. It was a blend of 50 percent conventional jet fuel, and 50 percent biofuel made by Sinopec from discarded cooking oil collected from restaurants in China. "We are honored to see our airplane fly on sustainable aviation biofuel from Shanghai to our nation's capital," said Pu Ming, vice president of Hainan Airlines, the plane's pilot. "As a fast-growing domestic and international carrier, Hainan Airlines is demonstrating our environmental commitment by showing that aviation biofuel can play a safe and effective role in China's air transport system." Biofuel reduces carbon emissions by 50 to 80 percent when compared to conventional petroleum, a vital characteristic as passenger demand increases. The Boeing Current Market Outlook foreseeing that China will need 6,020 new airplanes by 2033 to accommodate the higher number of fliers. "We are very pleased to work together with Hainan Airlines, China National Aviation Fuel and Boeing to accomplish this remarkable flight, which is a milestone," said Sinopec spokesperson Lv Dapeng. "For many years, Sinopec has maintained a leadership role in China in terms of the development and application of biomass fuel including aviation biofuel and bio-diesel. This fully represents an earnest commitment from Sinopec to continuously advance scientific and technological innovation and promote green and low-emission development." Boeing has partnered with numerous agencies and institutions in China in the development of sustainable aviation biofuels. China's first aviation biofuel test flight was with a Boeing 747-400 using China-grown, jatropha-based biofuel. Boeing also works with the Commercial Aviation Corp. of China and Chinese Academy of Science's Qingdao Institute of Bioenergy and Bioprocess Technology, on aviation biofuel development. The long-needed revamping of FAA's Part 147, the rules governing aircraft maintenance technician (AMT) schools, is underway, Steve Douglas, manager of the agency's Aircraft Maintenance Division, confirmed. Updating the standards, which have been largely untouched since 1970, is now "a priority" within the agency's Fight Standards group and drafting of the proposed rule has started, Douglas said at the Aeronautical Repair Station Association's annual conference. Part 147 lays out the minimum curriculum for AMT schools, covering issues such as how many instructional hours must be spent in specific areas. Douglas said one change in the new rule will be moving the curriculum requirements into Operations Specifications, where they can be changed quickly, as opposed to leaving them in the regulation itself, which takes more effort to change. Out-dated curriculum requirements that have not kept up with technology are among the main complaints industry has about the current Part 147. While aircraft that fly in the flight levels have pressurization-failure warning systems, accidents involving apparently hypoxic pilots keep happening. Stacy Pappas Sawaya, president and CEO of Carlsbad, Calif.-based Aviation Technology, researched these types of accident and invented a new portable warning device-the AltAlert "personal cabin pressure monitor"-that pilots can use to help detect a pressurization failure well before it causes hypoxia. AltAlert can also help remind pilots flying unpressurized high-altitude aircraft that it's time to don oxygen masks. The AltAlert device is easy to carry into any aircraft and can either clip onto a shirt pocket or be suction-cupped to a window near the pilot's field of view. Both aural and LED visual alarms warn the pilot that the cabin altitude is climbing above specific thresholds. AltAlert is available from many pilot shops and retails for $399.95. The AltAlert is based on a NASA patent, but what Sawaya and her engineering team did was develop algorithms that make the device work reliably and consistently with a long battery life of 18 months. "It took about four years from the concept to getting it completely developed and bringing it to market," she said. "I started researching the number of accidents logged with the NTSB related to pressurization," Sawaya explained. "The Payne Stewart accident was the most highly publicized, but the total number is enormous. It was really just a coincidence that the TBM 900 went down last September; we were finishing up by then. It was yet another example of the need for this device and its lifesaving capabilities." AltAlert is built around a pressure sensor. The algorithm drives six alarm modes, from nothing until 10,000 feet to combinations of a flashing LED and audible chirps at various higher altitudes. Above 10,000 feet, the red light flashes every 15 seconds along with a single "courtesy" chirp. Above 11,500 feet, the light flashes every five seconds and two chirps warn the pilot that cabin altitude has reached that level. Above 12,500 feet, the light flashes every second and there is a triple chirp. At this point the AltAlert also starts a 30-minute timer and if the aircraft's altitude is between 12,500 and 14,999 feet after that interval, it switches to the above-15,000-foot alarm (the highest alarm). The above-14,000-foot alarm is flashes a red LED every second, but adds a constant double chirp. Above 15,000 feet, the LED and the chirp both remain on constantly. The first four modes can be muted, but once above 14,000 feet, the device cannot be muted. I tested the AltAlert in a Cessna 172 with another pilot. We both used a pulse oximeter to measure our oxygen saturation as we climbed to 12,500 feet west of Van Nuys, Calif. We were going to go higher, but the 172 would have taken too long to climb the remaining 1,500 feet and we had no supplemental oxygen. Also, we felt that our oxygen saturation numbers precluded remaining at high altitudes any longer. The AltAlert worked as advertised, and the LED was clearly visible and the chirps audible even with my passive headset on. It's difficult to say whether the AltAlert would capture a pilot's attention during a cabin pressurization problem, but it would certainly be useful to have as a backup device and it should increase the chances that pilots or even a passenger flying in the other seat might notice that there is a cabin-altitude problem. Where it seems AltAlert could really help is during a slow decompression, especially in an airplane without an automatic emergency-descent autopilot mode. "We're really excited about it," said Sawaya. "It's been lot of hard work and a lot of sacrifice." One pilot bought an AltAlert after experiencing a slow leak caused by a failing door seal. "He was getting hypoxic," she said, "and was able to recognize it and do an emergency landing before any tragic consequences. He said, 'I wish I had this a year ago. I'm one of the lucky ones.' To be able to put something like this on the market for a reasonable price is something we're really proud of." On a cold March afternoon, RJ Garma is flying a tiny quad copter in a parking lot at the Rochester Institute of Technologies. The craft, about two feet wide, hovers various hundred feet in the air as Garma controls its movements using an application on his tablet. A camera mounted to the bottom of the copter sends overhead images of the campus back to him. But Garma is not just a student out for a few hours of fun. He's a U.S. Air Force captain, a doctoral candidate in the school's imaging science plan, and a single of a handful of RIT students and faculty piloting a revolution. The college has long been identified for its knowledge in aerial and satellite photography - a science recognized as remote sensing. So it really is no surprise that RIT has now emerged as a single of the world's leading centers for research on drones, small unmanned aircraft. David Messinger, interim director of the school's Center for Imaging Science, says he gets calls almost every week from organizations seeking this experience, and graduating students are in extraordinarily high demand. Messinger says he cannot recall 1 in the final 10 years who walked across the stage without having getting a job lined up. "Our students do not bother going to the job fair," he says, "because when employers want our students they come here and speak to them straight." The Digital Imaging and Remote Sensing Lab is the largest group within the center, and about 3-quarters of the DIRS students are functioning on masters and doctorate programs. They are highly sought soon after by government and sector alike. The Federal Aviation Administration has also turned to RIT. With drone technology advancing quicker than regulators can hold up, the FAA has designated six organizations across the country to conduct study to support devise guidelines for the operation of unmanned aircraft systems (UAS) in the United States. RIT and the Massachusetts Institute of Technologies are the lead institutions for 1 of these six, a coalition of universities and business called the Northeast UAS Airspace Integration Research Alliance, or NUAIR. The development of affordable flying platforms - as well as ever smaller and cheaper digital cameras - has abruptly produced aerial photography some thing any individual can do. For a few hundred dollars, you can walk into the mall or go on line at Amazon and get a uncomplicated drone capable of taking images. With a modicum of talent, just about any individual can take overhead photos of an urban landscape or a all-natural wonder. These breathtaking images are good, but what is seriously driving interest, what's turning this into a science and big business, is the idea of converting those aerial images into helpful information. "If I launched a drone and more than the course of half an hour it covered the whole RIT campus at a 1-inch resolution, I am not going to be able to physically appear at all of that data." Messinger explained. "You have got to have some back finish processing schemes that attempt to extract data out of the information. "That's what you genuinely want. You don't want the images. Nobody cares about the pictures. You want the info that you can get out of it," he said. 1 of the very first locations to leverage this new technology is precision agriculture, and researchers at RIT have been building systems to address difficulties like drought management and disease detection. Here's how it operates. A farmer launches a modest drone by just throwing it into the air. The aircraft circles a couple of times to orient itself, then it goes back and forth till it has taken high-resolution photos of every single individual plant in his entire field. When it lands, the information is downloaded to a laptop that can begin analyzing the photos, asking concerns about what the pictures show. Questions like: Is that plant wholesome? Is there a gap in my irrigation technique? Is there a broken pipe someplace or an infestation of a thing that is moving across the field? A test system launched in Genesee County final year, testing sensors that can estimate crop yields, spot possible pests or diseases, and support farmers to apply fertilizer additional precisely. One more project by an RIT student examined vineyards in the Finger Lakes, making use of spectral imaging to assess water levels in plants. Messinger says that the method normally starts with researchers going to prospects and saying "this is what we can do, inform us if it really is valuable." If you could look at each plant in a thousand-acre field each and every day, what could you find out from that? In some cases it is about creating these complex applications, but other times it is about developing options for simpler challenges. Garma has been working on a technique that requires off and follows him as he walks about. It flies in circles about him taking pictures. It is primarily a selfie drone, and it is not tough to visualize all sorts of sensible applications for this technology. Carl Salvaggio, an RIT professor who oversees the undergraduate system at the Center for Imaging Science, is operating on constructing functionality into unmanned systems that tends to make them easier for nonexperts to use. You are not often going to have Ph.D.-level engineers like him to operate these systems, just after all. Salvaggio created an cheap imaging technique that can transmit reside images of an area about an acre in size. It's created for law enforcement or initial responders who want to get an overhead view of what's going on in true time. "A user can just point at a spot on Google Maps," Salvaggio stated. "The system will figure out where it is, turn and preserve the camera educated toward that point on the ground the user chosen." In addition to the technology push, there is also an application pull: folks who come to RIT with a particular trouble they have to have support solving. And probably the greatest trouble is the one faced by the Federal Aviation Administration, which is charged with developing a plan for acquiring drones integrated into the national airspace. They're concerned about these affordable fliers getting in the way of industrial aircraft, of course, and there are all sorts of technical and logistical difficulties that will need to be addressed. As one particular of the lead test centers for NUAIR, researchers at RIT are operating on options for these challenges. "With manned aircraft, we're pretty superior at navigating from point to point," mentioned Agamemnon Crassidis, a professor in RIT's Kate Gleason College of Engineering and the academic director for NUAIR. Commercial aircraft use sophisticated navigation systems with an array of higher-tech sensors. "These systems are massive and they are high-priced. You happen to be not going to put an $80,000 inertial navigation program on a small unmanned aircraft," Crassidis mentioned. "We're trying to develop sensors that are just as precise but a great deal more affordable, weigh much less, use much less power, and obviously are a lot smaller." Collision avoidance is a major concern because drones are flying at lower altitudes than conventional manned aircraft. Crassidis says it's quite quick to avoid buildings or hillsides, but that smaller obstacles - electrical wires or tree branches - present a extra complex challenge. Part of the solution is developing far better "detect and keep away from" algorithms, but the genuine advances will be driven by those new sensors. "The wide variety of potential applications for these unmanned systems is incredible, but we have to be capable to do the testing to figure out how we can do those factors safely," Crassidis stated. "In terms of the technology, we're pretty close." China has made a significant breakthrough on the development of the blades used in aircraft engines. The technology can be applied to other new models for military use, reports the Chinese-language Guancha Syndicate. According to China Aviation News, Southern China Aviation Industry Aviation Industry Group, affiliated with China Aviation Industry Corporation (AVIC), announced the results of the advanced single crystal blade development on March 18. A blade to an aviation engine is like a major organ to the human body. As aircraft models evolved, the development of blades has gradually shifted to a single crystal blade, which in China was previously purchased from overseas. In 2013, AVIC decided to focus on the research and development of this technology. After countless experiments, the research team achieved a satisfying result through testing different temperatures, materials, and module tools adjustment. The first prototype production passed examinations and the yield rate was 40% higher than those outsourced from overseas, the report said. AUSTIN, Texas -- For its next trick, Google will begin flying 84-foot-long airborne wind turbines, said Astro Teller, the head of Google X, the company's lab of "moonshot" projects. The enormous kite-like turbines will take flight next month, Teller said at the keynote capping off the Interactive portion of South by Southwest. Google has been working on Project Makani, as these wind turbines are called, since buying a company of the same name in 2013, but until now, the search company has been testing only 28-foot-long models. The turbines to be introduced next month will be full-scale models. Why flying turbines? Wind speed is faster and more consistent at higher altitudes, but it's impractical to build taller ground-based wind turbines due to their weight (we're talking hundreds of tons), Teller said. That's why Google is focusing on airborne turbines instead. "There's an enormous benefit to going up higher," said Teller, speaking at the Austin Convention Center. The Project Makani kites look like the wingspan of a large airplane minus the cabin in the middle. Each kite has eight propellers that it uses to take off and a tether that keeps it attached to the ground. After the kite ascends to the limit of the tether, which is more than 1,400 feet, the propellers stop climbing, Teller said. At that point, they begin serving as flying wind turbines and the kite starts doing large circles in the sky. Combined, this generates 600 kilowatts of energy that is sent continuously down the tether. "If this works as designed it would meaningfully speed up the global move to renewable energy," said Teller, whose title is "captain of moonshots." Google has been flying its 28-foot models in Pescadero, California -- one of the "gustiest" places in the world, Teller said. Wind speed and wind direction there can change drastically in a matter of seconds. Despite the harsh conditions, Teller said Google failed to crash a Makani kite after more than 100 hours of flying, and that's not exactly a good thing for Google. Teller's keynote focused on the benefits of failing fast. Failing in an experiment allows Google to learn something new and improve its projects. CEO Larry Page told Teller he wanted at least five kites to crash, but since none did, the company now goes into testing of the full-scale model without that knowledge. "We're all kind of conflicted about that," Teller said. "We didn't want to see it crash, but we also feel like we failed somehow. There's magic in everyone believing that we might have failed because we didn't fail."